George Seybold, Landau, Germany, c. 1890-1900. Three train. Cast iron, modular pillar and plate frames. Hour and quarter, count wheel strike. Unique free - oscillator / grasshopper escapement design. Harrison type maintaining power. One second, crutchless, wooden rod pendulum. Movement equipped with 30 second gravity-based escapement remontoire. 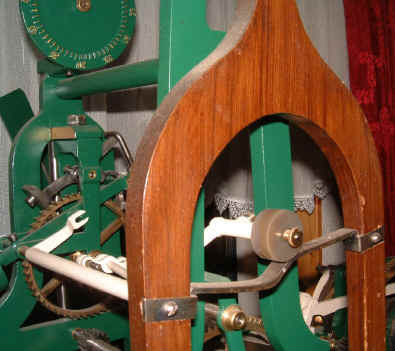 47"w x 28"h x 16"d.
George Seybold began his training at the famous Mannhardt tower clock fabricators in Munich. Later he opened his own firm under his name, but it remained small and few clocks were built, making this one of the rarer from Germany. It contains several novel mechanical features. The escapement is of a unique design. Similar to a grasshopper, the hounds tooth escape wheel provides the impulse to raise a finely counter-balanced arm. Attached to this arm is a roller made of agate that comes into momentary contact with a contoured strip straddling the large opening in the pendulum rod. 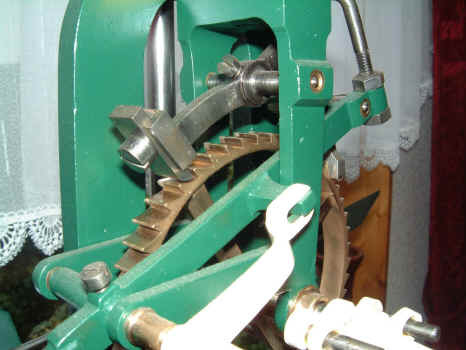 At the time the roller is positioned over the short angled portion of the strip it gently lowers a half inch providing the impulse to the pendulum. The escapement wheel's arbor contains two different, specialized universal joints that allows it to 'bend' and 'stretch' leftward as its pinion rolls over the second wheel. This pinion is contained within a cage that is counter-balanced. As the pinion rolls, the cage tilts. At about fifteen degrees the remontoire detent is activated and the system resets the cage back to vertical. 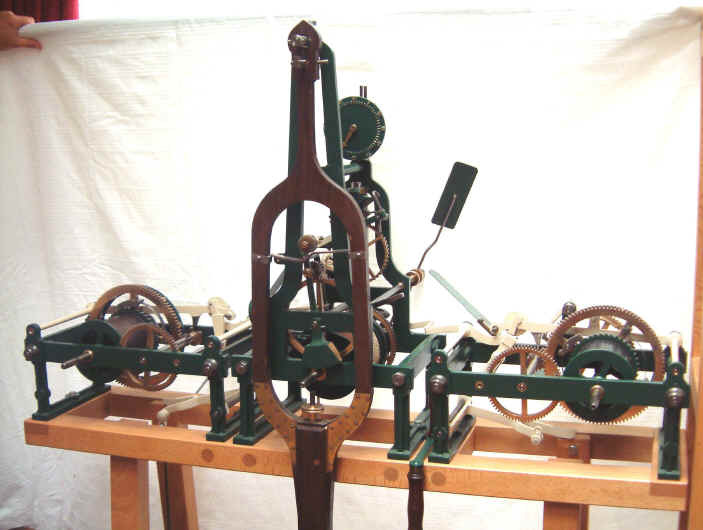 This arrangement was developed to obviate the need for any oil on the escapement, just as in John Harrison's famous grasshopper design. The problem of oil thickening and developing a drag upon the escapement was a particular issue in Germany's colder regions. This is the only gravity-driven remontoire I have seen that operates directly on the escape wheel arbor. Generally only spring remontoire achieve this. In theory, the closer a remontoire is operating to the escape wheel, the better. Spring remontoire have this advantage over train remontoire as the latter are usually operating one wheel from the escape wheel - the second wheel down the train. 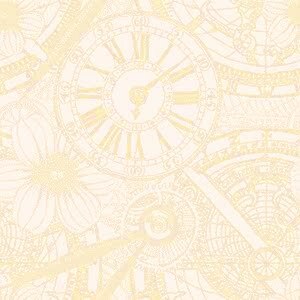 The disadvantage of spring remontoire is the fact that the spring will exert a decreasing force as it unwinds, whereas the train remontoire have the constant force provided by gravity. This remontoire, though it's clever use of the universally-jointed escapement arbor achieves the advantages of both. In theory this should make for a perfect remontoire. In practice, one suspects that the use of universal joints will introduce some error. For more discussion on remontoire see Wagner. The clock has a modular design that has separate components for the time and strike trains. This flexible design simplifies the construction of the clock for any installation application. Several other German firms used this concept including Schneider, Schwilgue and Ungerer.